The social enterprises carryout lots of great, fun activities for the people we support and the local communities to get involved with. Here you will be able to find out what each of the social enterprises have been up to this week. A blanket of snow has covered The Walled Garden in Leyland today; how beautiful and peaceful does it look? Wrap up warm and visit our social enterprise in Worden Park this week. We have had some lovely frosty mornings in Worden Park recently! The weather is looking warmer this weekend, come an visit us, we’re ope, weekends 11am -3pm. Click here to view the Walled Garden Facebook page. Come in and enjoy our new gluten free orange chocolate cake, made in house for you to enjoy. Michael made the large one this morning; you don’t want to miss out! Only a few days left to enjoy our special this week! We have Broccoli, Leek and Stilton soup served with our home made soda bread and butter, perfect for a winter’s day for £3.05; we are open 9:30am to 3:30pm! Great news, due to the popularity of our Soda Bread we are currently baking loaves to sell at £2.50 each. Our freshly made soda bread will be available to buy at lunchtime! David from our Roccoco team has been busy making a red velvet cake! Visit the team in Leyland tomorrow and treat yourself to a large slice of delicious cake for £2.50! Click here to view Roccoco’s Facebook page. We have been very busy helping to prepare for our community Craft session at the toddler group at Chorley Methodist Church where lots of children had fun making a hanging snowman, even some of the adults enjoyed joining in! We would like to give a special thanks to Lee, Emily and Karen for helping to deliver the session and to all the team at Crafty Uniforms for the background preparation during the week. Our Arty Crafter’s were delivering a Crafty session today at Genesis a support group for people living with Dementia, their families and carers. As February 14th is fast approaching, we made Valentine’s cards and everyone had a fabulous time, and some great Reminiscence conversation too, Well done James our photographer and Joanna and Tina our crafter’s for a great session. We delivered craft sessions at Home Start Central in Lancashire recently, we were thrilled when a member of the group who’s new to crafting come into our shop to proudly show off her latest achievement; a beautifully decorated wooden heart! It’s great to see her growing in confidence and trying out new things. Well done! Please keep the photos coming everyone, we love to see what you’ve been inspired to make! We have had several birthday celebrations recently and love an excuse to have some birthday cake and bring out our birthday banners! This month we celebrate Damion, Emma and Emma’s birthdays… here’s wishing you all a wonderful year ahead, from all the team at Crafty Uniforms. Our team have been really busy preparing items to display in our shop window for Valentines’s Day. We have 3 hearts ready to go in the window, one is going to say “WE”, the other is going to say “LOVE”, can you guess what the third heart will say? The snowy weather has slowed down our usual gardening rounds, but we visited some of our regular customers to clean their driveways of snow and ice. Our team have also been busy helping to re-pot and style the large Bonsai trees at The Walled Garden in Worden Park and after seeing the first snow drops appear, it won’t be long until spring arrives and the gardening season starts properly. Rebecca and Jennifer enjoyed some quality time with Digby the rabbit recently. As he is too big, we aren’t really able to hold him so Rebecca makes sure to spend some time in his pen with him each week. Pop in and say hello, we’re open every day between 10am to 3:30pm. Two of our fantastic team members, Edward and Robert, have been busy grooming the rabbits today to get them ready for visitors through the week! Click here to view Pets’ Corner Facebook page. 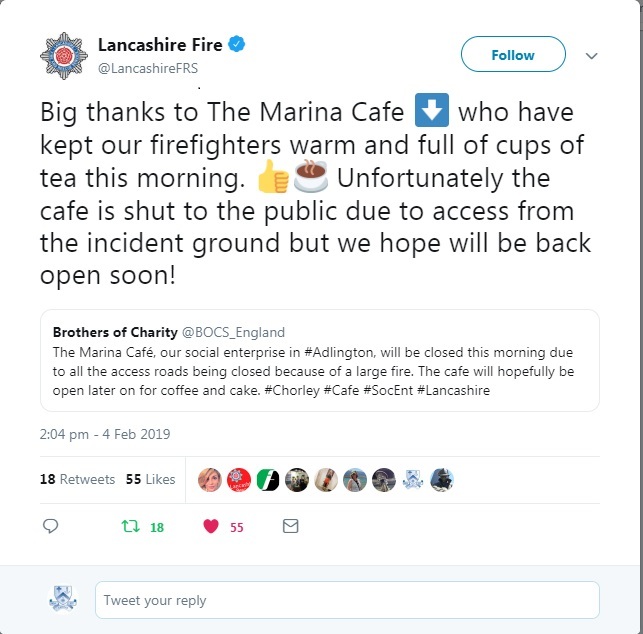 As the Marina Cafe was closed yesterday due to the large fire just down the road; some of the fire fighters were stationed on the marina car park for breaks and changes. 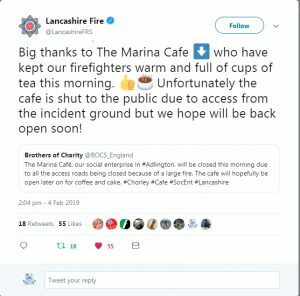 The team at Marina Cafe offered out cups of tea to keep the fire fighters going and as a result they kindly added the below post to their twitter feed. The fire fighters have also asked if they can make a generous donation to the Brothers of Charity through a fund they have.